While trick-or-treating is a timeless Halloween tradition, cherished by both parents and kids alike, there is no denying that there is some risk involved with this beloved activity. Consuming candies and other seasonal snacks from neighbors that are seemingly strangers to you and your family is concerning. Therefore, prevention is the best approach. 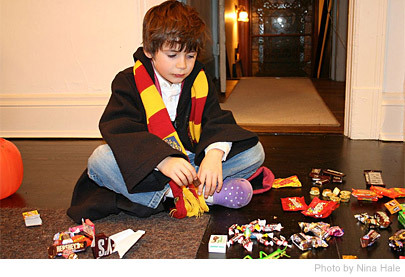 Conduct a thorough candy checking process before you allow your kid to start digging into their holiday loot. "Halloween Candy" by Nina Hale is licensed under CC BY 2.0. Create Awareness: Your kid needs to be aware of the dangers of consuming any type of food or candy that’s been tampered with. Make sure they know that it is important for you to check their candy after their night of trick or treating before they can get a taste of their hard work. Depending on the situation, a stomach ache could be the least of your problems after consuming candy that has been tampered with. After all, as a parent, you want to prevent any potential risk that can be avoided. Practice Patience: Your kid may be tempted to gobble their rewards down on their way back home, but you must make them understand that this may not be the best idea. Ask them to wait until they get home so you have time to sort and check through the treats, before allowing them to start eating their Halloween candy. To reward your kid’s patience, consider preparing a fun incentive at home. Thorough Candy Check: Although incidents with tampered Halloween candy have become rare, it is often better safe than sorry when you are managing your kid’s health and safety. Make an extra effort to look out for unusual appearances, like discoloration, tiny tears in wrappers, small punctured holes, and spoiled items. Additionally, homemade items like baked goods should be immediately discarded unless you personally know the person who made them. Your safest bet is to trust commercially wrapped Halloween treats ONLY. Be Skeptical: If you are suspicious about a specific Halloween candy that your kids collected during the night, don’t be afraid to throw them out. Your kids will have more than enough candy to spare after the Halloween season is through. Additionally, be sure to remove any candies that you may evoke choking hazards or pose a threat due to dietary restrictions, such as allergies.